Where to find me, and read about my writing. I write regularly in coffee shops and libraries. 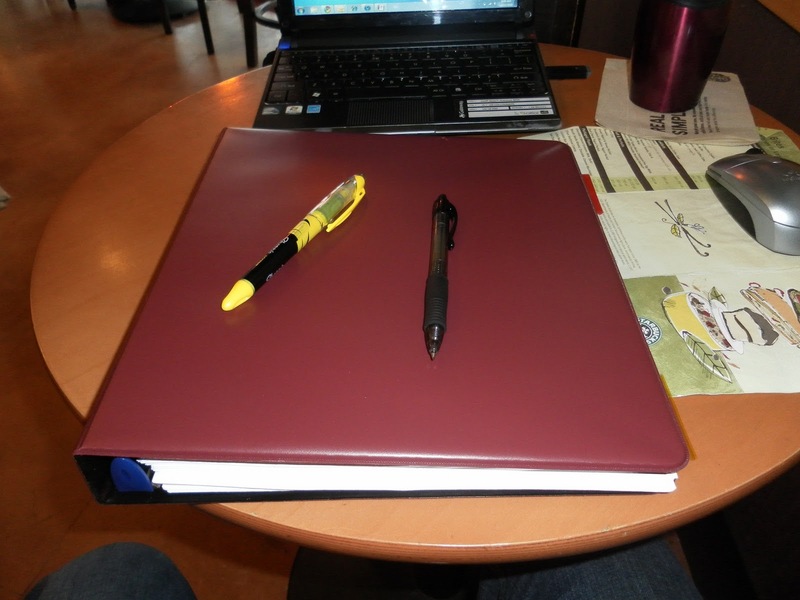 I am more easily distracted at home, so I am constantly carrying my netbook around. I am paranoid about losing my novel through either theft of my netbook, or from a computer crash that I can’t recover from. I don’t want to imagine losing my first novel. I don’t know if I would have the strength to write it again. I have been using the online service DropBox. Dropbox is essentially an online drive where you can store and backup your information. Not only is the information backed up, but you can you access files from any computer or Smartphone. When you sign up for the (free) service, you place a folder on any device you use regularly. When a file is saved to the local folder, a copy is stored online, and the folders on your other devices are updated as well. You can also access the folder on any random computer by going to their website and signing in with your password. 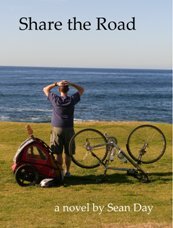 When I was writing the first draft of Share the Road, I backed it up after each session. And either through paranoia, or to create a road map of how far I got each day, I sent a separate file each day leaving all the previous ones intact. There are 30 versions of the first draft, one for each day I wrote. I did the same thing for each of the edits, so there are more than a hundred files, each with a slightly different version of the book. I doubt I will ever go back and pour over each version to see what each contains, but it is sort of interesting to look back on the file dates to see how long I took on each round of editing. I probably won’t even open more than a few of the files at any time, but it is nice to know they are there, backed up on another server in case my computer fails. And of course, most everything is backed up on another external drive in case the cloud fails me. You can never be too careful. I enjoyed the first read-through. I found good bits and pieces that I had forgotten about. I could see the occasional a-ha moments that happened as I wrote my way into the story. I saw again how random things I put down early in the story popped up again later. And after reading it through, I finally had a title I liked. It was really rough, but it only made me want to make it better. And it needed a lot of work. There was rambling, repetition, and lots of typos. Though it is not a story where lots of things are happening (think Cast Away), it was in desperate need of fleshing out. I had pictured the scenes in my minds eye, but I had not brought that clarity to the page. During the first round of editing, I primarily focused on bumping up the descriptive parts, painting a better picture of the world my character was passing through. Since this was not a plot driven book, I needed to be able to pull the reader into the world if it would have any chance of getting them to keep turning pages. I would work on polishing the story on the second pass-through. This approach to editing is the reverse of most recommended methods. Why bother fleshing out the scenes in a story if you aren’t even sure if they are going to remain in the book. But for some reason this is what appealed to me. I needed to be pulled into the world as well, to find reasons to be there, to find details I previously missed. And I found that I enjoyed editing. I was surprised by a couple of things. Editing was as slow or slower than putting down the first draft. As hard as I struggled getting the story down on the page, I couldn’t imagine going any slower. But in a way editing was more difficult. I wasn’t pouring over every word, but the focus was definitely finer. Just as I was trying to notice more details in the imagined scenery, individual words and sentences clamored for attention. But I found that I enjoyed the tweaking. It still felt like I was discovery writing even though I knew the story already. By taking a closer look at the scenery passing by, I found more inspiration, and so did the main character. The story still wasn’t worth showing to anyone else just yet, but it felt like I was headed in the right direction. My first novel, written in a rush in just over a month. There was pride, there was elation, there was computer screen eye fatigue…now I had to read the thing. One of the many lessons from On Writing was to shelter away your first draft and show no one the work in progress. It is just too rough, and you are already filled with enough self-doubt that you don’t need anyone else reinforcing that feeling. You just need to lock yourself away until it is all done. When I say no one had read the book, I mean even I hadn’t read it. Part of the NaNoWriMo challenge is to turn off your internal editor. I was not entirely successful as my fingers hovered over the keys too long before striking them. But I did resist going back and messing with what was already down on paper. When I opened the Word file each morning, I would go back a couple of paragraphs to see where I left off, but no farther. Part of it was the time crunch and not having time to rewrite anything. Another was I was worried that I would read it and see how horrible it was and get discouraged. But now it was done and it was time for the first read. On the advice of many, I intended to set the book aside for a while. Wait for at least a month to distance myself, maybe start reading it in the new year. But I didn’t wait all that long. I was home for Christmas, and had some time on my hands. I reasoned that it had been almost two months since I wrote the first chapter, but it was just an excuse. I wanted to read the damn thing. I went to Fed Ex/Kinkos and printed it out. Bought a shiny new binder and a fresh highlighting pen. I went to a coffee shop, bought a strong cup of coffee and dug in. I started making corrections and pausing over paragraphs all over again. I was getting too bogged down, obsessing over phrases and punctuation. The highlighter was messing it up and I wasn’t reading the story. I wanted to read it once through without critiquing it (or at least taking notes) to see if it held together. I ended up setting the notebook aside. I found a program online that would convert my Word file to a mobile format, and downloaded the book to my Kindle. There are ways to make notes on the Kindle, but it is more cumbersome than with pen and paper. Reading it as an eBook made it easier to just read. No real notes. Some judgment. Parts of it were painful, but there were certain points or turns of phrases that brought a smile to my face. It needed a lot of work, but I enjoyed reading it for the first time. Now it was time to edit the thing . I was over two thirds of the way through the month, but not as far along on the word count. I had been doing a pretty good job at clawing my way back toward that purple line over the past five days, but as my text on the 22nd implied, I was hitting another stall point where doubt and terrible writing were creeping in. I wrote nothing on the 24th, and very little on the 25th. I was bumping up against the turning point in the novel. Unfortunately, I didn’t exactly know what that turning point was going to be. I was stalling, not sure where to go. Five days until the deadline, 16,500 words to go. The character in my book was riding his bike down the west coast. He was physically moving down the road as the story unfolded, and he had reached a nice stopping point. Something needed to happen. I was running out of time and real estate. So I plunged ahead. Over the next few days, I wrote furiously. The combination of the approaching deadline and my own discovery about where the story was leading spurred me on. The story started to move, and the words came more easily. It certainly did not “write itself” as I have heard some people describe it, but in a way I was more detached and excited to see how it would turn out. Over the final five days, I wrote those 16,500 words, plus a few more. At noon on November 30th, 2010, I had 50,213 words toward my first novel. I had made it. Through all the stalling and all the days where I didn’t write, I had crossed the finish line with twelve hours to spare. The good news/bad news? I’m wasn’t done. When I was stalled at 33,000 words, I didn’t think I had enough left to say to make it to the 50,000 word mark. But the turning point ended up being longer than expected, so I have a few more chapters to go until I reach “The End”. I took a much needed break for a day or two, but was back at it after a couple of days. On December 12th, I had 9,000 more words and the first draft of my first novel. My first novel. Hard to believe. But the work and fun were just beginning. I want to vomit on my keyboard. Who is writing this crap? Oh wait, its me. I sent this text to my writing buddy on day 22 of the 30 day challenge. He said that if he had ripped out the backspace key, he would have been finished long ago. I suggested that we turn down the screen brightness all the way so we didn’t have to read what we were writing. Lack of confidence and that niggling feeling of self-doubt. The feeling that what you are creating is not only poor, but worthless and laughable. I am sure that even successful writers feel this insecurity at times, and there may be no way around it. It is something you just have to plow through. If it turns out you were right, and the thing you were creating was indeed crap, well, you’ll find that out soon enough. No need to torture yourself in the meantime. I’d like to say that I kept this in mind at all times, but of course I didn’t. Several times a day, that lingering feeling would creep in and stall my progress. But like that one good golf shot that gives you hope after a terrible round, there would be that one idea or turn of phrase that sustained me through all self-critiquing. But it was always a bit of a struggle. I sent up the text message flare because I knew my buddy would understand my frustration. With the door shut, downloading what’s in my head directly to the page, I write as fast as I can and still remain comfortable. Writing fiction, especially a long work of fiction, can be a difficult, lonely job; it’s crossing the Atlantic Ocean in a bathtub. There’s plenty of opportunity for self-doubt. If I write rapidly, putting down my story exactly as it comes into my mind, only looking back to check the names of my characters and the relevant parts of their back stories, I find that I can keep up with my original enthusiasm and at the same time outrun the self-doubt that’s always waiting to settle in. The first draft – the All-Story Draft – should be written with no help (or interference) from anyone else. There may come a point when you want to show what you’re doing to a close friend (very often the close friend you think of first is the one that shares your bed), either because you’re proud of what you’re doing or because you’re doubtful about it. My best advice is to resist that impulse. Keep the pressure on; don’t lower it by exposing what you’ve written to the doubt, the praise or even the well-meaning questions of someone from the Outside World. Let your hope of success (and your fear of failure) carry you on, as difficult as that can be. I did not show anyone the first draft of my novel while I was working on it. I probably didn’t need the above lesson to keep it locked away, but it helped reinforce the decision. At the very least, I figured I should be the first reader. Since I hadn’t been reading it as I went along, there was a certain amount of excitement to go back and see what I had created. But paired with that was the always present self-doubt, and I think showing an incredibly rough draft to the world would only amplify the feeling. Especially a work in progress. I agreed that the head down, shut out the world approach was the best for me. Even with these barriers to self doubt, it still creeped in as indicated by the text to my buddy. But by the end of day 22, there were 32,117 words down and I was approaching the turning point in the book. Whether or not the Outside World would ever see it, the creation continued. Part of the attraction of the NaNoWriMo challenge is the vague sense of accountability it gives you. No one is looking over your shoulder to see what you have written, or slapping your hand with a ruler if you set aside your writing to check Facebook, but you still feel responsible (if only to a website) to get the work done. How many words you should have written by now. How far behind or (just imagine) ahead you are. Your current daily word count average. When you will finish at your current pace. Number of words you need to write each day in order to finish in a month. But the biggest motivator for me was one of the simplest. The purple line. The blue bars are your daily totals, and the purple line is where you need to be each day to reach 50,000 words in 30 days. It doesn’t get much simpler than that. As you can see on the graph, I put myself behind the 8-ball by writing absolutely nothing for the five days I was in Phoenix. At the worst, I was almost 8800 words, or five days behind. I had another non-productive day on the 17th, but over the next four days I was able to get in some extra work and reduced the deficit to around 5600 (or 3 days). I was still too far behind, but I was slowly clawing my way back. Writing is definitely a rhythm thing for me, and motivation often follows momentum. But nothing focuses my energies like an approaching deadline. I found the simple, graphical representation of where I needed to be at all times more helpful than anything to keep me on track. It felt like I was almost physically reaching for the bar to pull myself back up. Week three was somewhat of a mad scramble to get caught up, and the added pressure helped to muzzle the inner editor (a little). The words weren’t coming any easier, but it started to feel like the good to crappy ratio was getting a little better. Certain elements of the story were starting to come into focus, and there were moments when I would pick up and expand on something I wrote, seemingly at random, weeks earlier. I still had a turning point and ending to work out, but chasing the purple line kept the story moving forward. I read somewhere among all the helpful material posted on the NaNoWriMo site that week two is often the hardest for writers. In week one, the excitement and novelty of the challenge keeps your motivation high. You are also doing a fair amount of world-building to set up the story, and some writers can spend many hours and chapters introducing all the players. In week two, some of the new-challenge glow has worn off, you are out of set up material, and it starts to feel more like work than fun. There are very few players in my novel, so I had less of the built in bit of introductory material to write. As I mentioned in the previous post, I started struggling early on, but I wrote enough each day to maintain the word average necessary to hit 50,000 in 30 days. For the first 10 days that is. Then I left town. I went to visit a friend in Arizona for five days. I brought along my computer thinking that I might get up early to get in an hour or two of writing before everyone else was up. But I was fooling myself. We stayed up into the wee hours each evening, and I just didn’t have it in me to take away hours from our visit to write. Outside of writing a few hundreds words while waiting for my flight, nothing was done for five days. I thought that at least some ideas would be percolating in the background while I stepped away from the novel, but it didn’t seem like I returned with much of anything new. Except an 8,000 word hole that I would have to dig myself out of. Time to return to my cramming skills developed in school. When I was younger, I could tune out everyone around me in a crowded restaurant or coffee shop, but could not resist the small distractions of home. If I wanted to get any work done, I had to get out of the house. I worked in restaurants all through school. School during the day, work four or five evenings a week. I would try to get some work done in between, but I was often up past midnight studying. But if I went home, tv or bed was too great a temptation. I spent many evenings at the local Denny’s studying or doing homework. I knew the menu by heart and was on a first name basis with all the servers. One was even inspired to go back to school after watching me study there night after night. I developed my penchant for coffee shops not long after, and could spend hours lost in a book oblivious of all the chatter of the nearby tables. Unfortunately, I have lost some of that ability to focus in a loud room. My ability to shut out distracting temptations at home is a bit better, but only slightly. I live with two roomies and a small child, so it is easy to get drawn into the activity of the house. So I had to go to the “office” to get my writing done. Starbucks was the most tempting, but I most often ended up at the local library to save money. 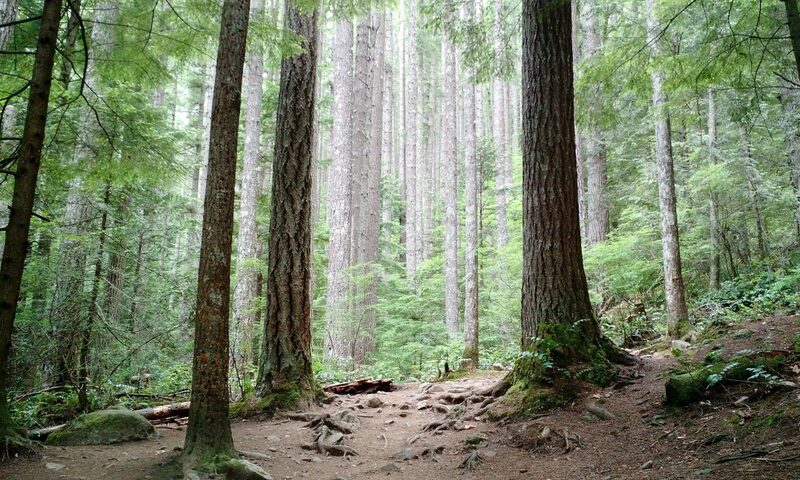 It is only a couple miles away, and of course there should be librarians keeping the noise level down. Most of the people there were huddled around the computers up front, so I often had the tables in the stacks to myself. I could spend a couple hours a day there getting my words in. Another site is called Write or Die. Depending on the consequences you chose, when you stop writing a pop up will taunt you, an annoying sound will play, or the program will start unwriting what you have written. The desktop version prevents you from using the backspace key. Fortunately, I didn’t have to go to the software nuclear options, but it was close. Day one, November 1st, 30 days to write a 50,000 word novel. 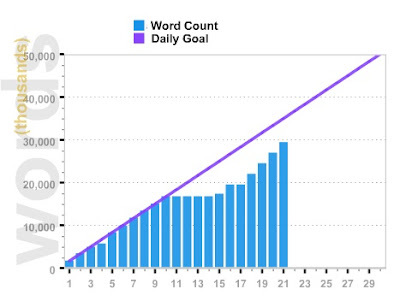 To make the 50,000 word mark, I needed to average about 1,700 words a day. I have no idea if this sounds like a lot to you, but in practice it felt huge at times. Day one went reasonably well as the details of the first scene had been working themselves out in the back of my mind. Day two, I was on my own. One of the stated goals of NaNoWriMo is to turn off your inner editor. That little (sometimes loud) voice that says, “that paragraph makes no sense, you have nothing new to say, you’re not much of a writer, no one will ever want to read this, this is all crap…” The point of the challenge is to create enough time pressure that you are forced to just write as quickly as possible. In order to get your daily count of words, you need to muzzle that inner editor. Quantity over quality. What you are writing may indeed be crap, but you can always clean it up later. If you listened solely to your inner editor, nothing would ever get written. For the first week of writing, I still struggled against the voices and hesitated too long over sentences. It would take me a while to get the ball rolling and I found myself staring too often at that little word count number at the bottom of the page. Writing became a rhythm thing, and things would speed up in the second half, but each morning I would stall out again. The one thing I was able to do to limit the inner editor was that I didn’t go back and read what I had written at the end of the day. Once it was down on the screen, I did not go back to it. Each morning I would read the last paragraph or two to see where I left off, but I would not go back any farther. I didn’t want to give my inner editor any more ammunition than it already had. I have seen the period before actual writing described as the “compost period”. You let stories and characters sit in the deeper reaches of your brain and let them ferment. I spent the month before NaNoWriMo doing just this, but it didn’t feel like I had much to show for it when November 1st rolled around. In truth, there were probably themes and ideas that would pop up later, growing in the background during the month, but there was little to start the pen rolling on day one. What I had was a backdrop for the book. It would take place along the Pacific Coast of the United States, hugging the coastline for much of the journey. As far as story, I had an opening moment (not even a scene) and one more scene I would use sometime later in the book. That is about it. As day one of writing approached, the details of the first scene were probably growing in the background, but I still had little idea where the story would lead. So I had permission to just wing it somewhat and see what would happen. But it felt like I was working without a net. Buy all your Amazon goods here and help support a poor writer. If you are the type of person who likes to read a story from the beginning, you can start at the first post and work your way forward. If you would like to reach me.